To Cite: Prabhu S M, Venkatesan B, Shetty G, Narula M K, Chauhan U, et al. Recurrent Sigmoid Volvulus Associated With Eventration of Diaphragm in a Twenty-Six-Year-Old Man, Iran J Radiol. 2015 ; 12(2):e8640. doi: 10.5812/iranjradiol.8640. Recurrent sigmoid volvulus is a clinical entity characterized by recurrent episodes of partial or complete sigmoid volvulus. Although it is commonly seen in the elderly, it can be occasionally seen in younger patients. Patients with recurrent partial sigmoid volvulus are relatively asymptomatic or present with mild abdominal pain. Early diagnosis and treatment is essential to prevent conversion to acute gangrenous volvulus. We present a case of recurrent partial sigmoid volvulus in association with eventration of diaphragm in a 26-year-old man. Sigmoid volvulus is a well-known clinical entity in sigmoid colon twists around its mesentery. It is seen more commonly in the elderly, but it can occur in young adults and children (1, 2). Recurrent sigmoid volvulus is characterized by repeated episodes of partial or complete sigmoid volvulus in which the volvulus may resolve spontaneously (1, 3). Patients with recurrent partial sigmoid volvulus are relatively asymptomatic or present with mild abdominal pain (3). This condition is seldom diagnosed clinically due to lack of awareness and its rare incidence. Recurrent partial sigmoid volvulus might develop into complete sigmoid volvulus with resultant increase in morbidity and mortality (3). Imaging features associated with recurrent partial sigmoid volvulus have been reported rarely. We present a 26-year-old man with recurrent partial sigmoid volvulus associated with eventration of left hemidiaphragm. A 26-year-old man presented with chronic constipation, occasional mild abdominal pain in the left lower quadrant, and a history of straining at stools. The patient was on laxative therapy for the preceding five years. He was previously diagnosed with partial eventration of left hemidiaphragm in childhood and had no associated respiratory difficulties. Patient had no history of passing blood in stools. Double contrast barium enema study revealed abrupt short segment narrowing with twisting of mucosal folds (twisted ribbon sign) at the rectosigmoid junction (Figure 1A). On air insufflation, there was gradual opening of the narrowed segment (Figure 1B). Long redundant sigmoid colon with partial eventration of left hemidiaphragm was seen (Figure 1A and 1 C). Findings of the colonoscopy were insignificant. Three weeks following colonoscopy, patient underwent contrast-enhanced computed tomographic (CT) scan of abdomen, which showed abrupt short segment narrowing at the junction of the proximal sigmoid colon and the descending colon on the axial scans with no significant proximal obstruction (Figure 2A). Coronal and oblique multiplanar reconstructed images demonstrated twisting of sigmoid colon along its mesentery with crowding of vessels at the site of narrowing (Figure 2B). Sigmoid colon was found to be redundant and extending up to lower border of the liver (Figure 2C). The descending colon was seen to be displaced medially. Eventration of left hemidiaphragm with migration of splenic flexure and spleen upwards was noted (Figure 2D). Patient underwent laparotomy with resection of redundant sigmoid colon and end-to-end colo-colic anastomosis. Preoperatively, redundant sigmoid colon with narrow mesentery at the base was seen. Multiple thin bands were noted in the mesentery of sigmoid colon with thickening of the mesentery. Patient reported improvement in his symptoms after surgery. Histopathologic examination of the resected segment revealed no evidence of malignancy. Figure 1. A 26-year-old man with chronic constipation and occasional mild abdominal pain in left lower quadrant. Double-contrast barium enema images. A, Short segment narrowing at rectosigmoid junction (arrow) with twisting of mucosal folds (twisted ribbon sign) and redundant sigmoid colon. B, Gradual unwinding of the loop and opening of narrowed segment seen on air insufflation. C, Eventration of left hemidiaphragm with upward migration of splenic flexure. Figure 2. Multi Detector Computed Tomography (MDCT) of abdomen with positive rectal contrast. A, Axial image shows short segment narrowing of the sigmoid colon (white arrow) at its junction with descending colon. B, Coronal and oblique image reveals twisting of sigmoid colon mesentery with beaking at site of volvulus (white arrow) and crowding of vessels. C, Redundant sigmoid colon (thin white arrow) reaching up to lower border of liver with abrupt narrowing of sigmoid colon at the site of partial volvulus (thick white arrow). D, Eventration of left hemidiaphragm and upwards migration of splenic flexure (thin white arrow) with convergence of vessels (black arrow) and abrupt narrowing (thick white arrow) at the site of twist. Sigmoid volvulus, an unusual cause of intestinal obstruction, is characterized by twisting of sigmoid colon around its mesentery. Anatomical feature predisposing to this condition is a redundant sigmoid colon with an elongated mesentery and a narrow base. High fiber diet, chronic constipation, neurologic or psychiatric illness, pregnancy, postoperative adhesions, and intestinal malrotation are among the predisposing factors for sigmoid volvulus (4). Tsunoda et al. first reported a case of sigmoid volvulus in association with eventration of diaphragm (5). On reviewing the literature, we found only two cases reporting sigmoid volvulus in association with eventration of hemidiaphragm (5, 6). Our case was diagnosed with eventration of left hemidiaphragm since childhood with upwards migration of splenic flexure and spleen and this long standing displacement probably predisposed the patient to recurrent volvulus of sigmoid colon. Sigmoid volvulus is usually seen in the elderly patients, but is well known to occur in children and young adults. The occurrence of sigmoid volvulus in young adults has been reported in the literature as isolated case reports/series and its exact incidence is not known (1, 2, 7-9). Female preponderance has been noted in young patients with recurrent sigmoid volvulus (1, 9). Sigmoid volvulus has a wide range of presentations ranging from a dramatic acute onset with abdominal pain and intestinal obstruction to recurrent minor episodes of intermittent partial volvulus in which the patients may be relatively asymptomatic. In addition, patients with acute complete sigmoid volvulus are believed to have mild recurrent episodes of partial sigmoid volvulus previously, which have resolved spontaneously (3). Patients with acute sigmoid volvulus present with acute abdominal pain and abdominal distension. Plain standing abdominal radiographs commonly show a dilated sigmoid colon with or without multiple small intestinal air-fluid levels. Specific plain radiographic signs described for acute sigmoid volvulus are coffee bean sign, northern exposure sign, and white stripe sign. The CT images might reveal whirl sign in the sigmoid mesocolon at the level of the volvulus (7). Levsky et al. noted that the typical features of mesenteric twisting (whirl sign) on CT might not be seen in all cases of sigmoid volvulus and concluded that there might be a previously unappreciated spectrum of disease appearances in cases of sigmoid volvulus (10). In contrast, patients with recurrent partial sigmoid volvulus usually present with constipation, abdominal distension, central or left-sided crampy abdominal pain and may be relatively asymptomatic (1, 3, 8, 9). Sturzaker et al. evaluated young patients with recurrent attacks of partial sigmoid volvulus and concluded that recurrent sigmoid volvulus is not uncommon in young patients and it is seldom diagnosed clinically (9). Due to lack of severity of symptoms, recurrent sigmoid volvulus is often difficult to diagnose and a high degree of clinical suspicion is required. Since patients with recurrent partial sigmoid volvulus are predisposed to develop acute gangrenous sigmoid volvulus, early detection is vital. Hence radiographic recognition is important for early diagnosis and treatment. Gopal et al. described “the twisted tape” sign that refers to the characteristic mucosal pattern of the sigmoid colon on double-contrast enema simulating a twisted tape (3). It is seen during the quiescent phase in cases of recurrent sigmoid volvulus and is believed to be due to relative spasm in between the attacks. 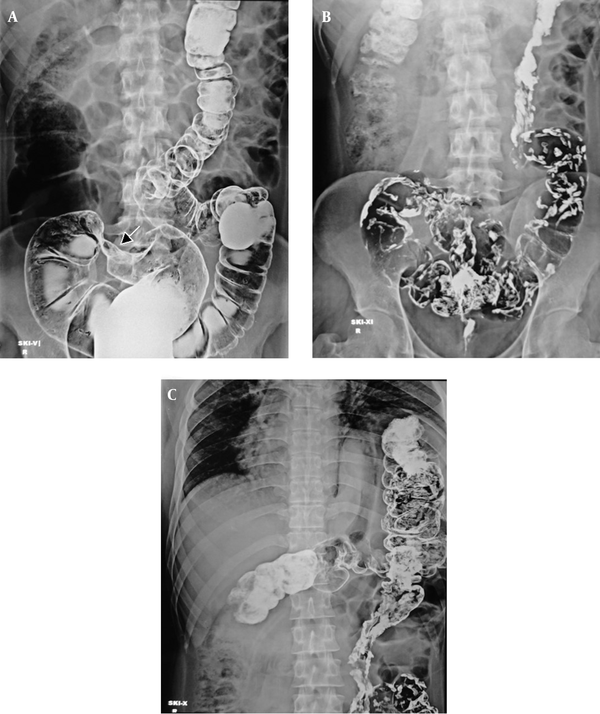 Our patient was relatively asymptomatic with chronic constipation and history of straining at stools and had features of recurrent partial sigmoid volvulus on two separate radiologic imaging studies with normal findings on colonoscopy. This emphasizes the importance of radiologic investigations in the diagnosis of this condition. Recurrent partial volvulus is one of clinical scenarios that could be seen in the broad spectrum of presentations of the sigmoid volvulus. It has been well documented in literature but has not received its due attention. 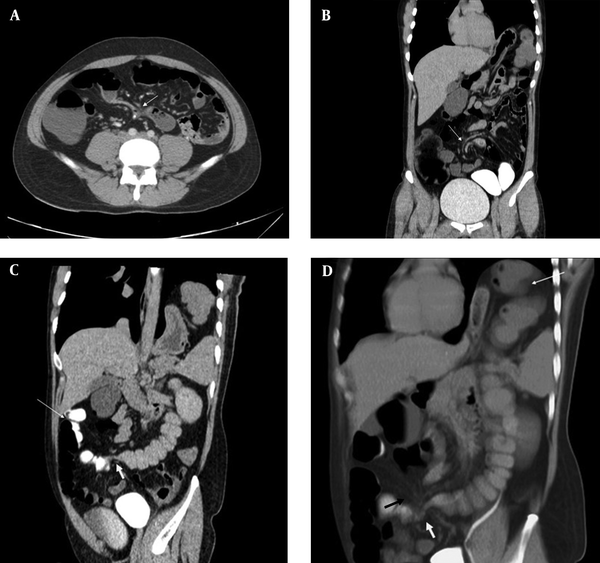 Our case highlights the imaging features of partial sigmoid volvulus in the subclinical stage in which only the twist of mesocolon may be seen without any significant proximal dilatation. Coronal and oblique multiplanar reconstructed images were particularly beneficial in demonstrating the twisting of sigmoid mesocolon and crowding of mesenteric vessels at the site of twist. A differential diagnosis for this imaging appearance would be a band (congenital or adhesive). However, our patient had not undergone any previous surgery. In addition, twisting was noted at two different ends of redundant sigmoid colon instead of a single point as would be the case with a band. Preoperatively, patients with recurrent sigmoid volvulus often show a dilated sigmoid colon with dense fibrous bands at the mesenteric base due to recurrent volvulus (1). Similar findings were seen in our patient. Larkin et al. noted the importance of definitive surgery in the management of recurrent sigmoid volvulus (4). Operative techniques such as primary sigmoid resection and anastomosis, sigmoidopexy, and percutaneous endoscopic colostomy have been used to manage recurrent sigmoid colon volvulus. Our patient underwent primary sigmoid resection with anastomosis and showed a significant improvement of his symptoms postoperatively. As the patient was relatively asymptomatic to the diaphragmatic eventration, it was not operated upon. This case highlights the importance of the role of imaging and the need of high degree of clinical suspicion in the diagnosis of partial sigmoid volvulus in young adults. Recurrent partial sigmoid volvulus is a clinical entity that may be occasionally seen in young patients. Patients may be relatively asymptomatic or present with constipation and abdominal discomfort. Clinicians must be aware of this condition as early diagnosis and treatment is required to prevent development of acute gangrenous sigmoid volvulus, which has high morbidity and mortality. Associated eventration of diaphragm might predispose to the development of recurrent sigmoid volvulus. Multiplanar CT with coronal and sagittal reconstructions have a definite role in demonstrating the partial sigmoid volvulus. Double-contrast barium enema has an important role in early diagnosis even in the quiescent phase. The authors would like to thank Dr Pooja Abbey for her valuable inputs.